As we come to the start of this new millennium, it is impossible not to reflect on the tremendous change this computing industry has seen over the past three decades. Why heck, three decades ago we hardly even had an industry at all. And as the millennium draws to a close we are seeing a paradigm shift within that industry. For decades, hardware has ruled the roost. Remember those big Alpha-based multiprocessing hunks that Byte used to present with "Best Hardware of Comdex" awards? They are gone. Supplanted by throw-away 400-MHz Celeron computers you can get for free. It used to be that you came back from Comdex with a bunch of "furry critters" stuck on your shoulder or hat. Now you can come away with a free computer. Buy a contract for Internet connectivity and the computer is thrown in for free. Software and content now dictate what we buy. My, how the world has changed. Sure, "software engineering" existed in 1965, but all interaction between the big machines and the programmers were via decks of punched cards. This was not a very productive environment. You would need to find a spare punch in the computer center, type out your program, (one line per card), and then submit the job to the operators, who would in turn place them into the computer's card reader. Half an hour later (give or take an hour or two) a printout showing the results of your labor would appear in your mailbox. Yet the convenience of punched cards was grace itself compared to the paper-tape input used on the first mini-computers. I could never understand why paper tape was fed through the machines so fast. My tapes always broke at least once during a boot procedure. I think, on average, whenever I gained access to the old PDP8 from my professors, it would take at least an hour to get it to take the boot tape. Then I would feed in my program, in Fortran of course, and wait expectantly for results to be printed on the teletype. But at least the PDP8 was my own responsibility (for a few hours at a time). If it gave bad results, that was my fault, and when it calculated exactly what I wanted, then I was the one who would celebrate. I started to feel like a programmer should feel. Until that time, memory had consisted of arrays of toroids and hairfine wires. Each bit was stored in the magnetic field of the toroids. The first personal computer had to wait not only for the birth of the microprocessor, but also for the first semiconductor memory chips. 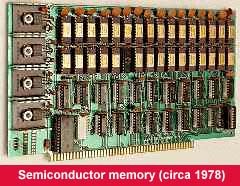 In 1969, I built my first semiconductor memory. Using 13 AMI S1685 dual 480-bit recirculating shift registers, I put together a 12,480-bit memory board (yes, that's 1,560 bytes). The half-inch diameter metal cans are the shift registers, the two 4000 series CMOS logic chips and the black epoxy transistors in the left foreground supplied the clock pulses and position counters for the shift registers. Before you scoff at the massive 12,480 bits of storage, please remember to get this much memory in the mainframes of the day would have required 12,480 individually wired magnetic toroids. A decade later everything had changed. By 1978, I could squeeze a massive 16Kbytes of static memory or 64Kbytes of dynamic memory onto a card. We also had busses, including the S100 bus, to handle interconnection between the cards in a system. This was certainly a big step forward. And the microprocessor had matured into a really useful computing element. 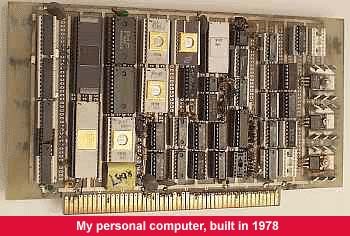 In 1978, I built an S100 computer system with four 16K static memory cards and two CPUs, a Zilog Z80, and a Signetics 2650. This is one of the 16K memory cards, using Intel 2114 memory chips. They are all in the shiny metal-bonded-ceramic packages, except for one, which used the new jet-black molded epoxy-resin. Epoxy was lower cost, and so fully displaced the ceramic packages by about 1980. Power? You think we worried about trees in those days? Look at all the power regulators and heatsinks down the left of the card. We were still a long way from the laptop. But this machine was a real computer. I programmed all the calculations for my doctoral thesis in Nevada Fortran on this Z80 using the Infosoft IOS operating system (a CP/M 80 clone). At the time, I also had access to the DEC-10 at the University of Southern California. Although the compiler on the DEC-10 was more rugged, the Z80 always gave me the results much faster than I could get them from the mainframe. This was my trusty S100 CPU card. The two 40-pin packages near the left are the CPUs, the rest of the card is dotted with EPROMs and logic chips. This board was of my own design, and implemented wire-wrap technology. Each of the wires from point A to point B was measured, stripped, and then bonded with a spinning tool to the specially lengthened pins on the backs of the IC sockets. You can bet I rejoiced a year or so later when printed circuit CPU boards became available. The first IBM PCs, as the 1980's opened, used an 8088 CPU connected to a relatively slow 8-bit memory system and extremely slow floppy drives. So, I still relaxed; proud that I could produce any computer system better than the next guy because "I knew all about hardware." Boy, was I about to be taught a salutary lesson. Sure the PC XT was slow, but there were a heck of a lot of people buying them and writing neat software programs so you could actually do neat things! Compaq came along with a faster compatible using the 8086, this time with a true 16 bit memory system, and suddenly the performance of my old Z80 was eclipsed. As the 1980s turned into the 1990s, it was standards that defined the advance of technology. Standardization on peripherals brought down costs and improved portability. I remember buying two double-sided 8-inch floppy drives for $1,500 back in 1982. As I climbed back into my car I realized I could have bought a new car for just four or five times what I had paid for those floppy drives. Standardization has driven today's prices down by a factor of 50. But it is standardization of software that has made the biggest difference. Remember when I said the Nevada Fortran was not as solid as the Fortran on the DEC-10? Well, at that time I had just three Fortrans to choose from (Microsoft was the third contender, but its compiler usually failed when faced with real Fortran code). Nowadays, the tools available to a programmer are superb. As a result, there is a plethora of excellent applications being made available to users. Only one dilemma was slowing the exponential growth of computing technology. How do you connect software users with software suppliers? If somebody is looking for a specific program, how can they find out where to go and see whether anybody else has already solved the same problem? As the millennium draws to a close, it is clear this final obstacle has been removed. The Internet lets everybody, everywhere, communicate with everybody else, everywhere else, without regard to distance or national borders. It is the single most important advance in the past three decades. And it is growing at an incredible pace. In another decade we will not be able to comprehend how we ever got by without it. And so it is fitting that computing hardware is now being given away with the purchase of Internet connectivity. Communication and connectivity are more important to human evolution than any room full of computing hardware. As this millennium draws to a close it seems the computers themselves drove the information revolution. But the next millennium will be driven by content. The King is dead. Long live the Queen.